After serving as the Assistant Hall Director for the last 2 years, Ezequiel is excited to return to Christie for another great year, this time as Hall Director. 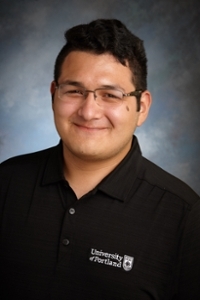 A proud UP alumnus, Portland native, and the first in his family to attend college, Ezequiel graduated with his bachelor's degree in Communication & Spanish in 2016, and his master's degree in Higher Education & Student Affairs in 2018. As a college student, Ezequiel loved his time living in Christie, as well as studying abroad in Austria and Spain. He is passionate about promoting diversity and inclusion, as well as supporting the first-generation college students on campus. During his free time, Ezequiel likes to travel, find the best coffee and brunch spots Portland has to offer, and read about pretty much everything!